In 1-gallon resealable food-storage plastic bag, mix beef and marinade ingredients. Seal bag. Refrigerate 30 minutes. Meanwhile, in blender, place spicy salsa ingredients. Cover; blend on medium speed until smooth. Pour into small bowl. Set aside. In large bowl, mix all slaw ingredients except lettuce until well mixed. Set aside. Drain beef; discard marinade. Heat 12-inch nonstick skillet over medium-high heat. Cook beef in skillet 2 to 3 minutes, stirring frequently, until brown. Toss lettuce in slaw mixture. 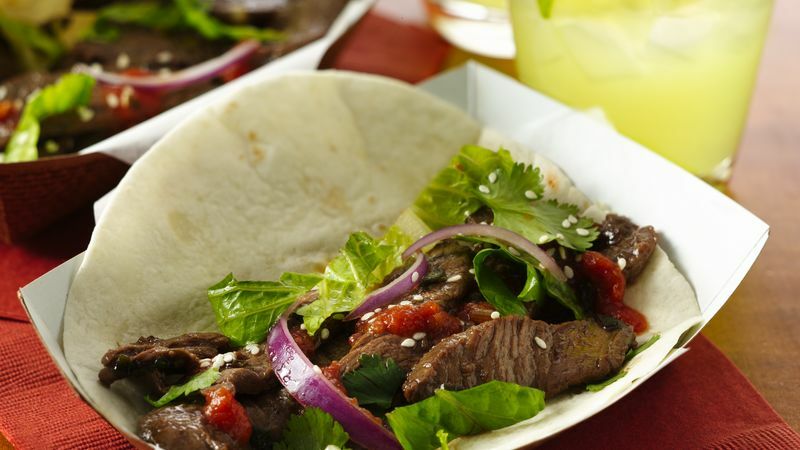 Spoon beef on warm tortillas. Drizzle with spicy salsa, and top with slaw. Sprinkle tops with sesame seed. To make a Fizzy Lime SODArita: Fill a glass with ice. Add 1 1/2 oz blanco tequila, 1/2 oz clear orange-flavored liqueur and 3/4 oz fresh lime juice; stir. Top with 4 oz chilled Mexican lime soda. Garnish with lime wedge. Makes 1 drink.